Experience the charismatic culture and rich historical heritage of Spain on a 2-day tour of Granada and Toledo on the route from Costa del Sol to Madrid. Accompanied by a knowledgeable guide, visit UNESCO World Heritage-listed attractions like the Alhambra and its gorgeous Generalife Gardens in Granada, and discover the medieval majesty of Toledo on a sightseeing tour. Luxuriate in comfortable 4-star accommodation and enjoy included entrance fees and selected meals on this enriching exploration of Spain. 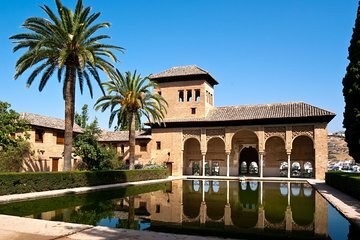 Sumérgete en la rica historia de España en una excursión de 2 días por Granada y Toledo, dos de las ciudades más ricas del país. Salga de la Costa del Sol y viaje en un cómodo vehículo con aire acondicionado a través del espectacular paisaje de las montañas de Sierra Nevada de camino a Madrid. Haga una parada para descubrir el patrimonio morisco de Granada durante una visita a la Alhambra, declarada Patrimonio de la Humanidad por la UNESCO, y explore la miríada medieval de Toledo, una ciudad fortificada encaramada en una colina que domina el río Tajo, durante una visita guiada. Se incluye una noche de alojamiento en un hotel de 3 o 4 estrellas, así como todos los costos de entrada, transporte a Madrid, comidas seleccionadas y un guía profesional. Salida desde la costa del sol por la mañana hacia granada. Visita de los jardines de Alhambra y Generalife, el último bastión de los Reinos Árabes en 1492, nos espera un entorno monumental asombroso. Por la tarde procederemos a Granada para cenar y pasar la noche. Desayuno y salida hacia la Ciudad Imperial de Toledo (ciudad Patrimonio de la Humanidad), donde todas las culturas y épocas de España (cristianos, moriscos y judíos) han convivido. Luego, un impresionante recorrido por los monumentos y productos más importantes de la ciudad, como el famoso 'Damasquinado' (incrustaciones de oro y plata en hierro). El tour concluye a su llegada a Madrid. Los hoteles detallados anteriormente son solo como referencia y están sujetos a cambios. The visit to the Alhambra on the first day was really great. I booked the three star hotel. The room was very comfortable and clean. The dinner was lovely, too. In the afternoon you can spend some time in Granada on your own. There is an optional tour to the gipsy district in the evening. For 30 you will see a Flamenco performance and have a nice view of the Alhambra by night. On the second day the bus needs about four hours to get to Toledo. There is a break in a small village. You should not go to the suggested tavern because the food is expensive and not very good. Afterwards the bus takes you to one of the surrounding hills of Toledo. This is a really beautiful spot. The next stop is a metalsmith shop. This is a rather lengthy stop. The visit to Toledo ends by a tour through the city itself. You will see the streets and the famous el greco painting. In my opinion the first day is really great. The second day was a bit lackluster. Furthermore I didn't like the tourist traps lunch on the second day, metalsmith shop. Therefore only three stars. Generally good tour with efficient use of time which you couldn't do if doing it on your own travelling from Costa del Sol to Madrid. They changed pickup time to later and didn't inform us so a little inconvenient. The bus had a problem on the first morning which meant we were running late all day so had a rushed visit to Alhambra but it was so spectacular, the gardens and building we forgot about being late. The extra add on night visit to the visit to the Gypsy caves and night walk was well worth while. Had the best trip. It was really great value for money and extremely interesting. Watching the Spanish Dancing and sipping Sangria was a nice added touch. Would definitely recommend to anyone who wants to see a bit of traditional spain but are limited on time. It was a lovely, whirlwind. The accomodations were quite good and our tour director along with the local guides were very good. My husband and I were awed by the history of both Granada and Toledo as described by our tour guides. There is so much to see that sometimes it was overwhelming. I was disappointed that there was little time for exploring the local shops for "treasures" to remind us of our trip. The tour bus was comfortable, and it was great making friends with our group members. Great value tour. Good motel and tour guide. Only bad thing is lack of info re where tour leaves from (not told correct area to stay night pre tour) and when contacted office they did not speak English so had to get someone to translate. Needed more pre tour organization. This trip was a welcome addition to my travels through Southern Spain. It was wonderful to sit back, relax and let my guide do all the hard work :-) I learned so much more about the history of the areas we visited when compared with travelling alone. I really enjoyed everything about this tour and really appreciated our guide taking us to the Gypsy caves to see the wedding dance. Great time!